This was the first time I met Peter. All during WWII we got letters from him from the Pacific. My mother, Peter’s half-sister, always commented with pride on how well he was coping with the military life although he made no secret of how much he hated it. To me, at age 12, he was the epitome of glamour. Since their father, Bil, spent his summers with us in those years the visit would have been to see him as well. The figures in the background of the picture are Bil and my father, Albert Ramsperger. Dad is the one with the bare back. I suppose the picture was taken by my mother, Peggy (Rickett) Ramsperger. Picnic Point is a long spit of land that sticks out into Lake Mendota from the far western edge of the University of Wisconsin campus. 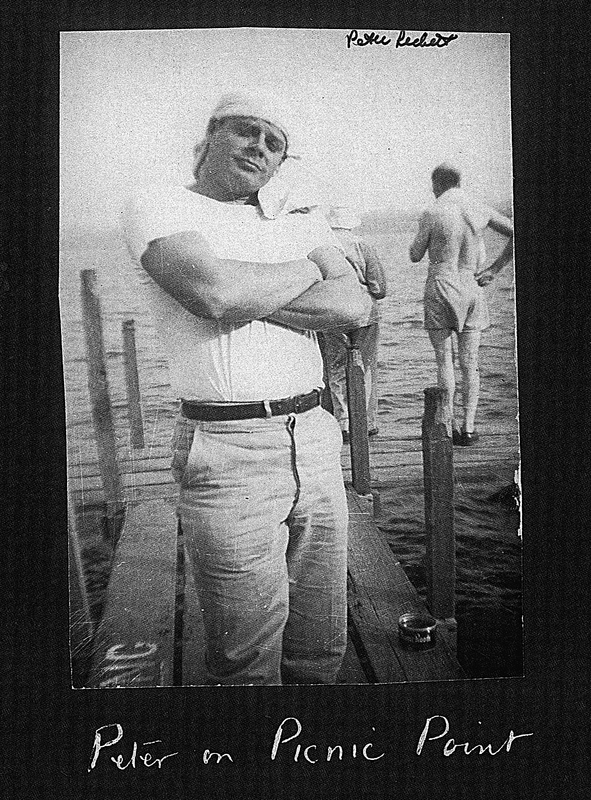 During the long summers Bil and my father went fishing almost daily in Lake Mendota. Many evenings Dad would row over to this pier on Picnic Point while mother and I walked out a long path from the road to the pier. Then we would picnic while admiring the view of the Madison skyline across the water.